This range of Fascinating Hand Embroidered Lehenga is marvelously decked out with beautiful beads, sequins, and many other such items. The lehenga is elegantly highlighted which gives a sleek look to the outfit, we offer hand embroidery services on fabric. 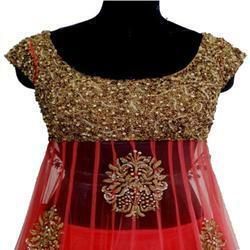 We are offering an excellent quality of Lehenga Embroidery Services. This range of Fascinating Hand Embroidered Lehenga is marvelously decked out with beautiful beads, sequins, and many other such items. The lehenga is elegantly highlighted which gives a sleek look to the outfit, we offer hand embroidery services on fabric.